The America’s Cup, sailing’s most iconic event, has been re-energized and rejuvenated, ready for 2013 and the future. The best sailors in the world will race on the fastest boats with the introduction of an exciting wingsail catamaran. To build interest and audiences ahead of the 34th Match in 2013 is a new annual World Series, commencing in 2011. A clear vision for the future led to analysis of the best practices in other major sports. Six months of dialogue with potential teams and stakeholders followed, resulting in the transformed competition details that were released today. The annual America’s Cup World Series has been designed to create exposure and commercial sustainability for teams and their sponsors. 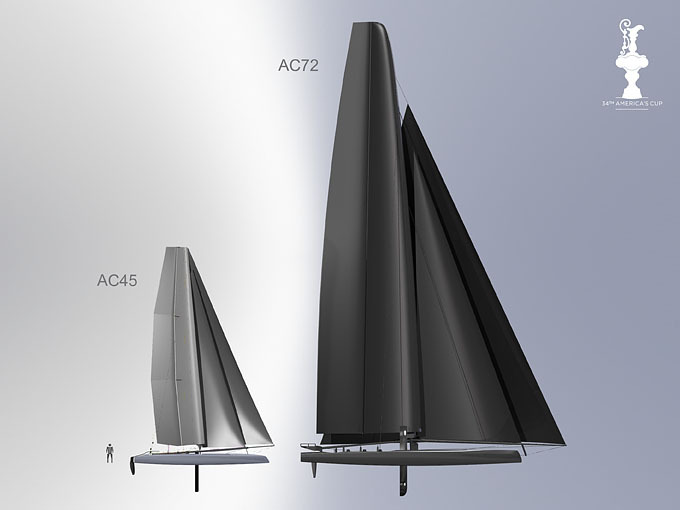 The series featuring the cutting- edge catamaran will deliver exciting racing to new audiences ahead of the America’s Cup Match in 2013. The Regatta Director of the independent organization America’s Cup Race Management, ACRM, will be appointed jointly by the Challenger and Defender board members. A financial model for the next Defender to maintain this vision of independent race management allows teams and partners to plan long-term involvement. “I think that we need to acknowledge that the Defender has kept its word. The America’s Cup is going to have fair rules and a truly independent management of the racing,” said Vincenzo Onorato, President of Mascalzone Latino. “This change should’ve happened years ago in my opinion. I can see why this important development could last for many years in the future,” Onorato said. Limits on the number of boats, sails, equipment and support boats, as well as the introduction of no-sail periods will bring significant cost savings for all competitors. Crew sizes will be reduced to 11 members from 17. For the first time onboard cameramen will be part of the innovative media model that is designed to significantly enhance the television broadcasts and internet content in an effort to grow audiences and bring added value to teams and partners. In releasing the Protocol, the Defender has forfeited some of the rights traditionally enjoyed by the holder of the trophy in the interest of making the competition more balanced and fair. Majority approval of the competitors is required to amend the Protocol. With today’s release of the Protocol, class of boat and year in which the match will be held, three of the four cornerstones for the 34th Match are in place. The final piece, the venue, is scheduled to be announced by the end of the year. Download the Protocol for the 34th America’s Cup here. Read this news story in Italian here. Watch a replay of the Valencia Press Conference here.